Q. 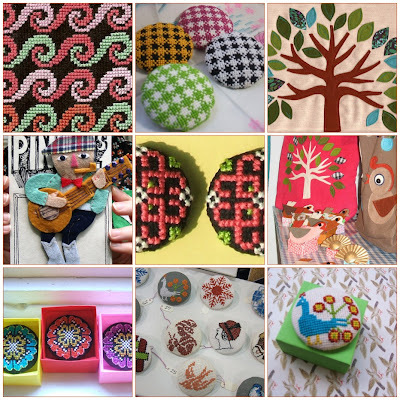 This is our first interview with not one but two talented crafters who are also friends! Can you tell us a little bit about your relationship, how you met and ended up crafting together? A. Sara and I met at a craft fair in Montreal in 2005. I remember seeing Sara’s work posted on the show’s website and thinking I’d definitely check out her table, and the day of the show we ended up right beside each other! 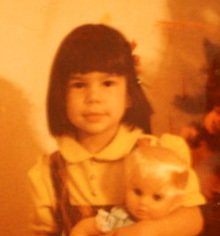 We’ve been working together ever since. Q. I have seen a lot of great cross stitch pins on your flickr photo stream. Do you both stitch and how long have you been embroidering? A. I (Sam) started cross-stitching about a year ago after looking through one of my many vintage craft books and thinking I’d love to give it a try. I was instantly hooked! It feels very natural to me as I love playing with pattern and colour. The possibilities are endless. Sara is an illustrator and uses her talents to create amazing appliqué for our tote bags. She hand-stitches and uses the sewing machine to apply the wool felt and scrap fabric which make up her unique designs. Q. Besides the great pins, you have made some wonderful totes and really cool paper doll cards, do you two have backgrounds in the arts? A. Our artistic backgrounds are varied. Sara studied Studio Arts at Concordia University, but she has always been artistic and created her detailed, vibrant puppet cards through practice and imagination. Most of the products we create are inspired by old craft books, children’s book illustration, and vintage fabric. My craft was self-taught, but is partly derived from some training in graphic design and illustration. Q. So it looks like you guys have quite a little business going on and have done some craft fairs. Could you give some advice or tips to those that might be thinking about entering a craft fair? A. Go for it! Craft fairs are tons of fun. As long as you work hard and believe in what you make, you’ll have a great time. One tip: The first few fairs you do may not be as monetarily rewarding as you might expect, but hang in there, patience, time and practice will bring success! Q. You have a website “coming soon!” Can you tell us about your plans for the website and what we might see? A. Our website will work as an online portfolio. There will be various links to Sara’s illustration and my cross-stitch work, as well as combined work and a link to our etsy shop which is already up and running, redroostercraft. Q. What has inspired you to create modern cross stitch and do you create your own designs? A. Modern cross-stitch is a combination of my love for old embroidery techniques and new geometric pattern and colour combinations. I get a lot of inspiration from op artists and modern paintings. Some of the patterns are variations from pattern books or interpretations of old designs. One of my goals for the future is to create my own unique cross-stitch designs, and to cover larger pieces with them. A. We both love listening to public radio! But we do that while working, so our other interests are: thrift shopping, eating at one of the many delicious restaurants in Montreal, reading, bike riding, meeting with friends. We really love what we do so we don’t have a lot of other interests! We also love coffee! Q. Do you have different roles in your crafty business and what do each of you bring to the table? A. The different roles are evident in the work we do. Sara does all of the illustration work including the puppet doll family, our business cards, product cards, and future website. She also appliqués all of our tote bags and creates special edition “Pin Pals” made of wool felt in a variety of characters. I create all of the cross-stitch work, fan and cornet brooches, quilt work (including quilted scarves and belts which are in the works) and I sew all of our tote bags. Outside of the creative roles, Sara and I both contact craft fair organizers, manage the business and scout fabric stores and thrift shops for accessories. We’ve never worked harder or been happier with our jobs! 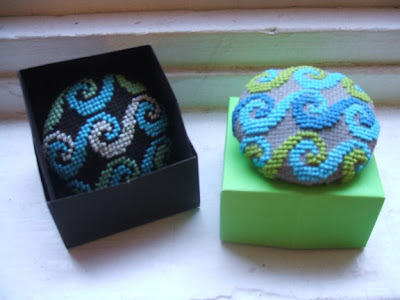 I don't remember why I decided to cross-stitch a waves pattern, but I do remember feeling restless until I found the perfect pattern and made a pin out of it! I really love the repetition and colour combinations you can use with this pattern. It's pleasing to the eye to see a bunch of waves floating along an aida cloth sea. 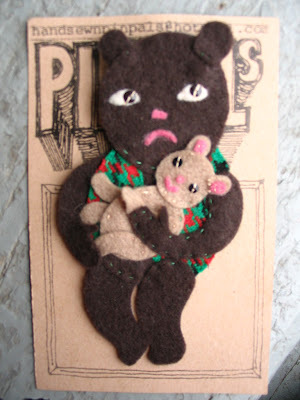 Momma and Baby are a highly detailed, original pin by Sara Guindon. You'll never see another one like it! Sara's "pin pal" pins were the reason I wanted to work with her, I had never seen such stitching artistry used to create her unique characters. Past pals have includes banjo playing beehived wearing singers, pipe smoking old men with hats, a marching band drummer and a beach ball beauty. These are little works of hand-stitched art! Thank you, Sara and Sam! Your work is wonderful and so inspiring. If you want to see more of Pin Pals visit their flickr photos, redroostercraft, and their soon to be opening website, The Pin Pals. That bear pin is too cute! These are so beautiful.....very inspiring. Thank you for showing them.